The Q8 concept, shown, previews a coupe-styled SUV that will take on the Mercedes GLE Coupe and BMW X6. 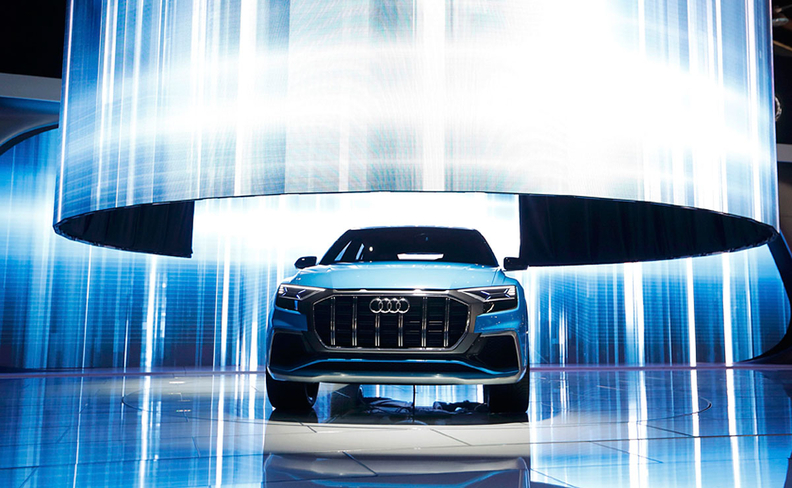 DETROIT -- Audi unveiled a sportback Q8 concept at the Detroit auto show Monday. Executives say it's a near production-ready version of a new full-size luxury crossover the brand will launch in 2018. Outfitted with an eight-speed automatic transmission, a 3.0-liter turbocharged direct-injection V-6 engine and a 100-kW electric motor, the plug-in hybrid Q8 concept delivers the equivalent of 443 hp and 516 pounds-feet (500 Nm) of torque, Audi said. 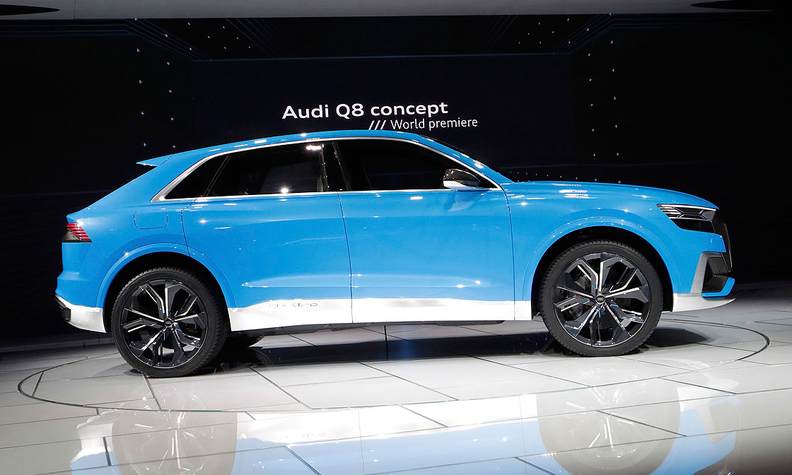 The Q8 concept is outfitted with a 17.9-kWh lithium ion battery pack, Audi said. The Q8 concept’s exterior design -- which Voggenreiter described as part coupe and part SUV -- harks back to the earliest Audi quattros, especially with its flat roofline and wide C-pillar. Audi said the lack of window frames around the Q8 doors contribute to its flat-looking roofline. Signature LED lighting, including flat, wedge-shaped integrated headlights, accentuate the design. Technology dominates the Q8 concept. The four doors are opened via touch sensors, opening to a predefined angle as soon as the door detects hand contact. Inside the cabin, Audi’s virtual cockpit presents an array of programmable and adaptable displays, with an integrated head-up display putting important information into the driver’s field of view. In addition to the Q8 concept, Audi showed new A5/S5 cabriolet models, and a new SQ5 high-performance crossover that will be available in dealerships this year.